Welcome to the New York City Internet Health Report, a Mozilla project made possible in collaboration with the NYC Mayor's Office of the Chief Technology Officer. To demonstrate what makes internet health meaningful for stakeholders and communities at the municipal level, this collection of case studies offers a portrait of a vibrant city working in different ways toward a common public good – an inclusive, safe, secure, open, and decentralized internet. Digital inclusion: Beyond access, participation is safe and meaningful for all of us, including those who are traditionally marginalized or excluded from digital participation. Decentralization: Instead of a few, the internet is controlled by many, for greater resilience, more diversity, and to prevent harmful concentrations of power. Privacy and security: Everyone is able to assess and use digital and data systems safely. Openness: Technologies and data that drive the Web are transparent and actionable. Web literacy: Everyone can read, write, and participate in the digital era, as producers and consumers. Piloting this project with New York City was intentional. After Mozilla launched the internet health framework in 2017, NYC saw its utility as a framework for action and planning, informed by a shared holistic approach to the internet and Mayor de Blasio’s commitment to values of justice driving the City’s historic tech and data focus. Now, there is evidence to report back on; we have a lot to learn from NYC's leaders about how to build healthy local digital ecosystems. By mapping these issues, and observing how they intersect with life in the city, this report illustrates the changing digital terrain in NYC and how intent, planning, and leadership -- in and out of government -- result in outcomes. Ideally, it helps stakeholders, decision makers, and advocates identify best practices that, with City investment, amplify initiatives and policies driven by civil society organizations towards continuous and positive impact — from technology initiatives in the public interest to equity-driven government investments serving all New Yorkers. This pilot report comes as historic advances in technologies of connectivity change how we connect with the world and each other, making the internet more indispensable and complex than ever. Although shifts open up new opportunities for justice, economic empowerment, and even happiness, they also come with immense emerging risks. Every day, New Yorkers rely on the internet to communicate, learn, work, and play. They also increasingly contend with proprietary algorithms making high-stakes decisions about their lives and families; data being shared and sold without consent; as well as persistent online harassment and increasing disinformation cycles. As a result, we see the erosion of public trust in civic processes that are rapidly moving online: crucial things like voting, the delivery of public services, and the newly digital decennial census. It’s the right time for NYC to re-imagine its relationship with the internet, to maximize its potential for being a fair and just city, not simply a “smart” one. That’s one reason why NYC has helped to launch the Cities Coalition for Digital Rights with Amsterdam and Barcelona. Together, and with a growing number of cities around the world, they are “committed to eliminating impediments to harnessing technological opportunities that improve the lives of our constituents, and to providing trustworthy and secure digital services and infrastructures that support our communities.” As cities, they “believe that human rights principles such as privacy, freedom of expression, and democracy must be incorporated by design into digital platforms starting with locally-controlled digital infrastructures and services.” As people wake up to the digital landscape, cities have the opportunity to be more accountable to the public they serve, and better define the practice of democracy in a digital era. The NYC Internet Health report grows from a rich, local tradition of defining, planning, and working to improve NYC’s digital wellbeing. For example, starting in 2011 with the Bloomberg administration, the City of New York released a roadmap to realize its digital potential through 40 initiatives related to infrastructure, education, open data, engagement, and industry. Since then, the scale of the internet’s impact on our daily lives and the increased delivery of city services via digital platforms has increased exponentially. On the civil society side, Civic Hall emerged to support public interest innovations using technology while BetaNYC generated community input into the People’s RoadMap for a Digital New York. In 2016, Tech:NYC launched to foster a creative startup and innovation culture, while Data & Society has spent years producing compelling research at the intersection of technology and society to better inform public debate. 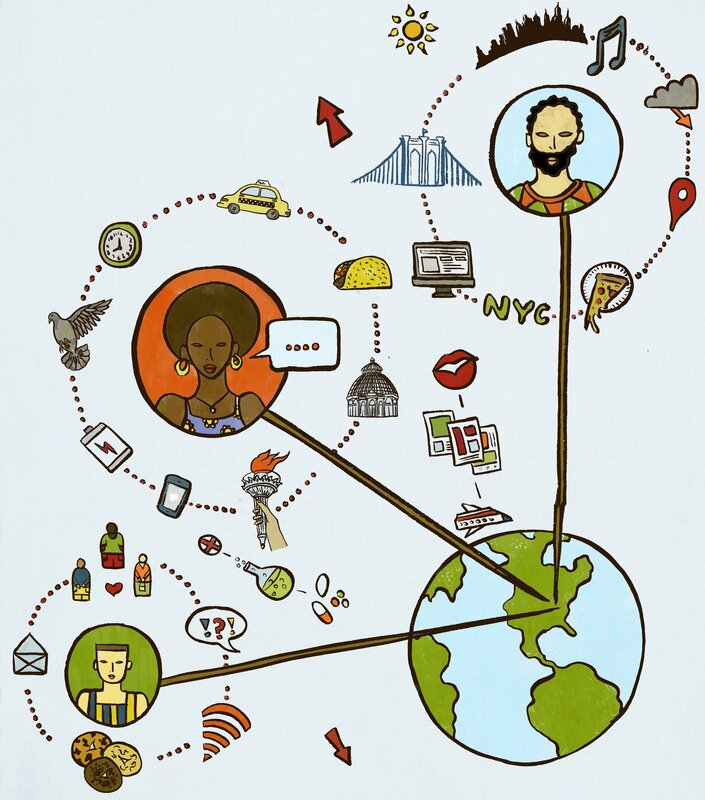 The activities and exemplars featured in this review, however, derive from the willingness of NYC’s CTO’s office to tackle inequalities through a steady shift in principled investment in and guidance of tech infrastructure, targeted policy-making, and public access initiatives such as LinkNYC and NYC Connected; an Internet Health & Human Rights working group across NYC government agencies; digital privacy workshops in the libraries citywide; and digital safety trainings for immigrant-serving organizations. NYC also boasts a City Council that prioritizes algorithmic accountability and privacy legislation that protects individually identifiable information. The internet health work featured here also builds from civil society convenings hosted first by the public library systems and then by The New School’s Digital Equity Lab, a research institute at The New School that examines structural inequities that persist and evolve as technology transforms culture, society, and politics. Taken together, and further inspired by public events like the Glassroom, which saw nearly 10,000 people pass through to learn about digital privacy, these efforts have laid the groundwork for further conversations, legislation, and policies shaping quality of life for all residents. Recognizing the momentum above, and building on the City’s deep bench of knowledge and experience, the NYC Internet Health Report is an experiment in localization that bridges place-based and community-driven projects with the universal goals of the internet health framework. Over the course of a year, Mozilla Fellow Meghan McDermott and CTO Senior Manager Samantha Grassle, collaborated to curate this field scan of the City’s digital landscape and its digital horizon, with the CTO’s office facilitating connections to a range of different activities, experts and leaders. Through scoping research, mapping trends, hosting convenings, and Mozilla-supported hands-on activities such as Data Detox trainings, as well as conducting interviews about the state of internet health in NYC and how it can be evolved, we produced this document. In applying five internet health issues as a new way to surface and categorize digital trends, research, values-driven policies, and essential voices – the often unsung strategies and people making the City’s internet ecosystem healthier – we identified public and private initiatives relevant and urgent to the technological and cultural moment. From building municipal influence through collective procurement power to the advancement of libraries and public computer centers as nodes of community learning and empowerment, there is amazing work to lift up across the City. And that is intentional – what’s wrong with the internet dominates the conversation. This report is about shining a light on what is possible and what’s working now, with people at the center – healthy, ethical digital cities. Community engagement: Internet health is not possible without the authentic engagement of those who are negatively affected by problematic interactions across markets, governments, and industry. Ensuring pathways for people and communities to steward and shape the technology that will build equal opportunity and justice is essential. What does that look like? The development of a city-wide digital equity alliance to ensure community voice in redefining “smart” as ethical and responsible to residents, including adoption of community-shaped principles for data and privacy. A City bond to tie CS roll-out to schools with broadband updates and device distribution. Enforceable, ethical standards on retention and usage for vendors to keep data safe, with more accountability when it comes to data privacy overall.